A snail's-eye-view of two Amanita mushrooms. The larger of the two has a cap approximately 8 inches diameter. The partial veil covering the underside of the cap (and at this stage hiding the gills) has not broken away yet to leave the skirt-like annulus (ring) on the stipe. 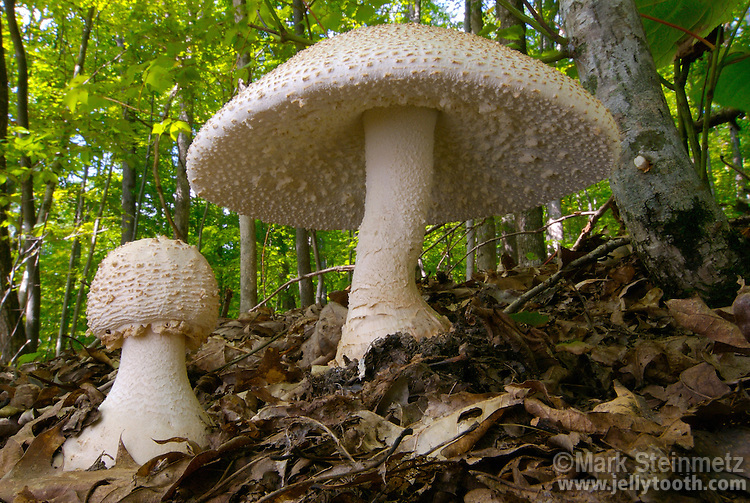 These mushrooms are in the genus Amanita, section Lepidella. A difficult section to identify to species, and some additional species in the eastern US are still likely to be described. This species could be A. daucipes, or possibly A. rhopalopus, or unnamed.